Give Your Hair the Perfect Form – Smooth Viking’s Forming Cream is a premium styling crème that effortlessly molds your hair into the exact style you want. This non-flaky medium-hold formula provides the perfect amount of hold to help you maintain the hairstyle you’re looking for. Want to know the easy way to achieve the wet look? Matte look? Professional look? Edgy look? You just found it. Adaptable for Any Condition – If you’re tired of your hair looking worse than it did when you styled it in the morning, this Forming Cream is perfect for you. Unlike other products out there, this cream offers just the right amount of hold to keep your hair looking its best during an active day. If you’re sweating at the gym, stuck in humid weather or have a long day at the office, you can count on this Forming Cream to lock-in your new look so you’ll never have to keep checking a mirror again! What Makes This Cream So Great? Here’s the Secret – Some companies throw a bunch of ingredients together and call it a day. Smooth Viking is the exception. We take the time to ensure that every ingredient is not only effective, but even good for your hair! That’s why we have included 100% Organic Argan Oil, as well as all-natural Soybean Oil, Beeswax, Vitamin E and Green Tea Extract to keep your hair and scalp feeling healthy and nourished. A Powerful Forming Cream from a Brand You Can Depend On – With Smooth Viking, you won’t need to worry about putting mystery ingredients in your hair. This mold is loaded with only the finest ingredients around to ensure you’ll have your ideal hairstyle in no time, and is proudly made in the U.S.A.
An Ultra-Versatile Cream for Any Hair Type & Hairstyle – Don’t waste your money at pricey hair salons! Instead, treat your hair to a supreme forming cream for a fraction of the price. Works great on a variety of hair types such as short, long, straight, curly, wavy, thick and thin. IF you’re looking to keep long, course hair in place or sculpting a suave, deconstructed style, you’ll find that Smooth Viking’s Forming Cream has all the right stuff to not only shape your look, but keep it that way. 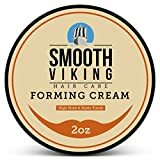 If you’re ready to ditch the dull, drab and lifeless hairstyle in favor of a sleek, suave or modern style, look no further than Smooth Viking’s Forming Cream. That’s right, we’re not JUST about beards! This men’s styling crème contains powerful ingredients that are specially designed to overhaul any hair type with a sharp new look. And don’t worry, guys! This isn’t some gunky, high-maintenance cream that turns out to be more trouble than it’s worth. This stuff works. Featuring a masterful blend of 100% Organic Argan Oil, Soybean Oil, Beeswax, Vitamin E and Green Tea Extract, your hair will not only look great, but it’ll also feel healthier than ever before. This entry was posted in Organic Health Products and tagged Best, Classic, Cream, Finish, Forming, Formula, Great, hair, High, Hold, Long, Matte, Modern, Pliable, Short, Slick, Smooth, Styles, Styling, types, Viking by Organic Health. Bookmark the permalink.